Tony's Talking Pictures Blog: New on DVD and Blu-ray February 12, 2019 "Bohemian Rhapsody" and "Widows"
New on DVD and Blu-ray February 12, 2019 "Bohemian Rhapsody" and "Widows"
Four women whose husbands died in a robbery attempt decide to go on a crime spree of their own. 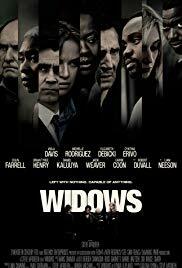 “Widows” had all the makings of a top-notch heist film. It had a stellar cast and a tried and true director with a story based on the British TV series from 1983. With all that going for it, the film became a clumsy, oddly paced and over-written mess with little substance for the audience to hang on to. In the end, “Widows” never came to a boil, leaving the viewer with an incomplete and frustrating mess. “Bohemian Rhapsody” is certainly one of the best pictures of the year. The film takes on the journey that Freddie Mercury traveled (although beefed up a bit with writing) as he becomes one of the most influential voices in music. Rami Malek is absolutely on point as the iconic singer, whose troubled past and identity issues combine to force him into the spotlight and center stage. The scenes of QUEEN performing are so well staged you'd believe you were in the 70's and 80's watching their rise. Each new venue steps up the momentum until the film explodes at the 1985 Live Aid concert, at which QUEEN made their comeback performance. Finally “Bohemian Rhapsody” has, arguably, the best soundtrack so far this year. Go see it. It will rock you. It's gets an A and is rated PG-13.